When you choose to bring home one of our Bernese Mountain Dog puppies into your family, you’re choosing to adopt a dog that is, truly, the best of the best. 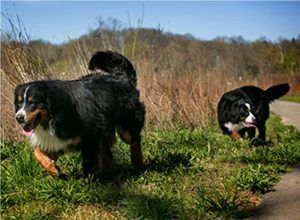 We breed Champion Bernese Mountain Dogs, which means that a puppy’s parents have competed on an international level against multiple breeds and have achieved the highest distinction. Champion dogs are of the premium stature, walk and quality, and our Champion dogs are bred with the best bloodline, all certified by documentation. Our breeding dogs are tested for hip dysplasia and other potential genetic problems to ensure that when you take home one of our puppies, you are taking home the very best.